Job Summary\\: The IT Technical Specialist IV performs advanced IT activities for specialized, complex and/or functional areas requiring the expert knowledge and professional application of IT principles, practices and techniques in accordance with industry standards and university policy. Requires a great amount of evaluation, originality or ingenuity. May be responsible for training, assisting or supervising lower level IT personnel and other staff. May lead projects and cross-functional activities. Additional Department Summary\\: Do you want to help enable groundbreaking research at the University of Alabama? Do you love to write software, and also have a genuine interest in research? Are you interested in applying your programming experience to a novel set of research problems? Do you want to help lay the foundation for Research Software Engineering at the University of Alabama? 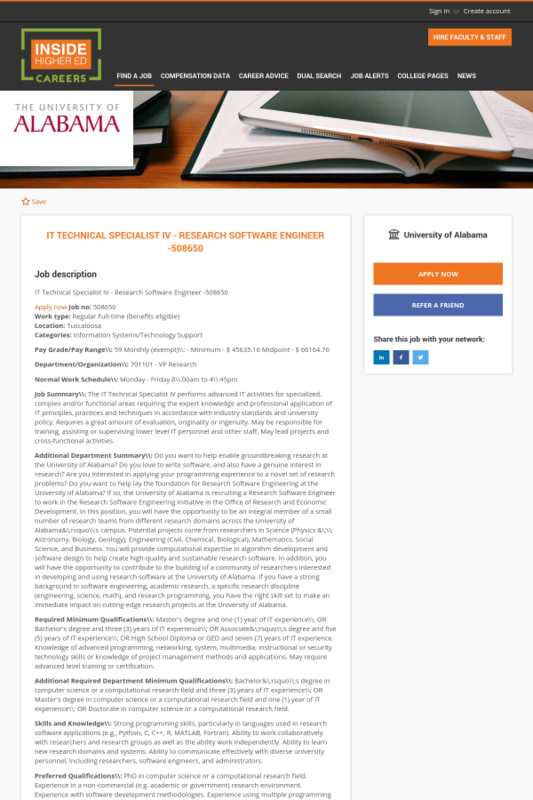 If so, the University of Alabama is recruiting a Research Software Engineer to work in the Research Software Engineering Initiative in the Office of Research and Economic Development. In this position, you will have the opportunity to be an integral member of a small number of research teams from different research domains across the University of Alabama&\;rsquo\\;s campus. Potential projects come from researchers in Science (Physics &\;\\; Astronomy, Biology, Geology), Engineering (Civil, Chemical, Biological), Mathematics, Social Science, and Business. You will provide computational expertise in algorithm development and software design to help create high-quality and sustainable research software. In addition, you will have the opportunity to contribute to the building of a community of researchers interested in developing and using research software at the University of Alabama. If you have a strong background in software engineering, academic research, a specific research discipline (engineering, science, math), and research programming, you have the right skill set to make an immediate impact on cutting-edge research projects at the University of Alabama. Required Minimum Qualifications\\: Master's degree and one (1) year of IT experience\\; OR Bachelor's degree and three (3) years of IT experience\\; OR Associate&\;rsquo\\;s degree and five (5) years of IT experience\\; OR High School Diploma or GED and seven (7) years of IT experience. Knowledge of advanced programming, networking, system, multimedia, instructional or security technology skills or knowledge of project management methods and applications. May require advanced level training or certification. Additional Required Department Minimum Qualifications\\: Bachelor&\;rsquo\\;s degree in computer science or a computational research field and three (3) years of IT experience\\; OR Master's degree in computer science or a computational research field and one (1) year of IT experience\\; OR Doctorate in computer science or a computational research field. Skills and Knowledge\\: Strong programming skills, particularly in languages used in research software applications (e.g., Python, C, C++, R, MATLAB, Fortran). Ability to work collaboratively with researchers and research groups as well as the ability work independently. Ability to learn new research domains and systems. Ability to communicate effectively with diverse university personnel, including researchers, software engineers, and administrators. Preferred Qualifications\\: PhD in computer science or a computational research field. Experience in a non-commercial (e.g. academic or government) research environment. Experience with software development methodologies. Experience using multiple programming languages such as R, C/C++, Java, Python. Experience with open-source software development. Background Investigation Statement\\: Prior to hiring, the final candidate(s) must successfully pass a pre-employment background investigation and information obtained from social media and other internet sources. A prior conviction reported as a result of the background investigation DOES NOT automatically disqualify a candidate from consideration for this position. A candidate with a prior conviction or negative behavioral red flags will receive an individualized review of the prior conviction or negative behavioral red flags before a hiring decision is made.